Located in the beautiful Ottawa Valley just outside of Eganville Ontario. This five bedroom three bathroom lakefront home is the perfect her treat from the hustle and bustle of regular day life. Surrounded by trees and nature. 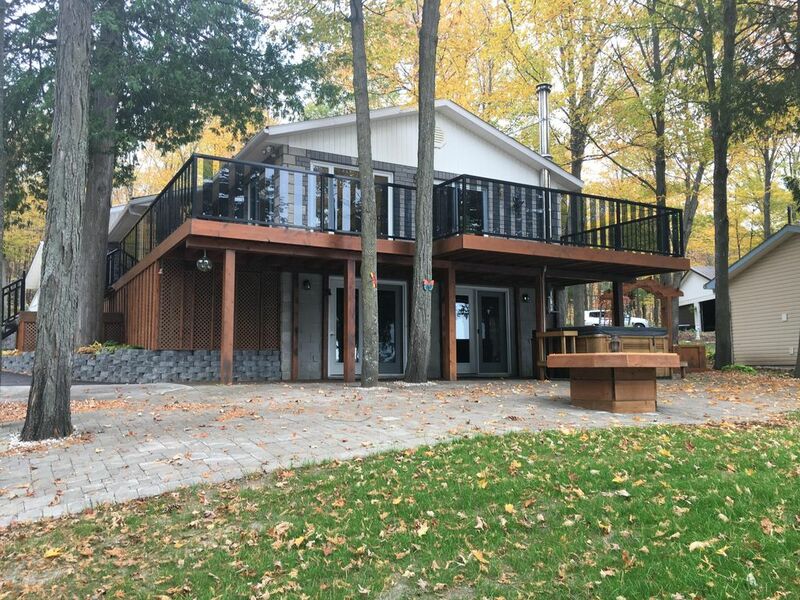 Take in the breathtaking views of mink lake from the deck with a coffee in hand or from the hot tub or soaking the stress away. Just like houses situated on over an acre of land. The waterfront is perfect for swimming with its gradual decline and sandy bottom. There’s also a fully enclosed outdoor going with Hydro. Great for having some separate time to read and relax or perhaps picking up on the porch. Well staying here you’re only 10 minutes to the town of Eganville or 30 minutes to the cities of Pembrook or Renfrew where you can get everything you need for your stay. You can always pop into the Amish market at their farm just around the corner for some vegetables and homemade jams and maple syrup. Or be adventurous and try some close by activity such as Fisher, white rafting, golfing, can you pick up orange, red lining, museum, horseback riding, are you fishing and snowmobile trail. Had a wonderful time at this property. Amazing setting by the water with plenty of amenities. Hot tub and pool table added to the the pleasure of the stay. Wonderful golfing int the area that is easy to get to. Would definitely stay here again! Thank you for taking the time to write this review. We are glad you enjoyed yourselves. We had a great stay at the lake house! A large group of us stayed, we asked for special permission for more than the max capacity. After figuring out details it was a perfect place with a lot of space and well kept bathrooms. We were on business so we didn’t have time to do any of the fun things it has to offer such as the lake, pool table or hot tub, but I’m sure they would make the experience even better. Thank you so much for taking the time to write this review. We are so glad you had a good experience. We are always open to hearing how we can make your next stay better than the last.